For a long time, I’ve wondered what it would be like to go to one of the big USGP CX races down in Bend, Oregon, or even over in Europe – the epic courses, the big heckling crowds, the festival atmosphere with music, costumes, signs and beer! I want to experience that one day – it’s officially on my Bucket List. So, what’s the next best thing if you’re living here in Alberta? Gotta be the Dark Knight! Set up inside the bobsleigh/luge run up at COP in Calgary, this race has all the core aspects of a great event, not to mention a race. It’s located within the city, making it easy to get to, especially for those of us travelling there, staying in hotels, etc… There’s lots of parking right at the site, and room for big crowds of cowbell ringing spectators and you can crank the music without waking up the neighbours! The course was easily the most challenging I’ve ridden so far this season. Ed Garvin and his crew of race volunteers went all out, creating a deviously tough course, that climbed, twisted and turned us across steep side hills, through massive sandpits, over gap jumps and constantly changing log barriers – there was even a smoke tunnel! Add in the fact that this race is at night, and you can quickly appreciate why this is not your run-of-the-mill Alberta cross race. I showed up about 5pm to get geared up, signed in and do some pre-riding. At this point there were already 30 or more racers there, carving their way around various parts of the course. Once I had my race numbers pinned on, I set out for my first pre-lap. As I rode out, I went by Ed and his volunteer course crew, as they put the finishing touches on their plans for the ‘Log Run’ and the ‘Gap Jump’. I knew right away the obstacles were going to be ‘amped up’ compared to other ABA races. This is one of the greatest things about the Dark Knight: because it’s not an ABA race, it plays by its own rules, allowing for a little more course ‘creativity’. With that in mind, it only took me about ¼ of the first lap to realize just how hard this course was going to be. Right from the start, there was quite a bit of climbing, with tight switchbacks, making sure you had to work for everything. 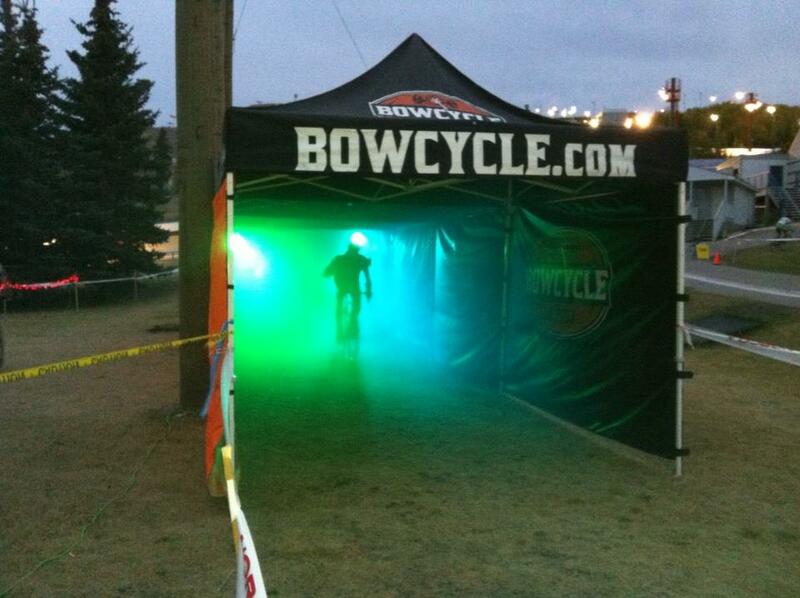 At the top of the course, I was surprised to see Bow Cycle had set up a full-on tunnel, with strobe lights and smoke machine, which was awesome! At the bottom of the course, I found ‘some’ reprieve from the hard grinding this course demanded, but it was short-lived, shooting you back up the hill, over thick, loamy grass, and into a the biggest sandpit I’d ever seen… I tried to ride it, but it was deep and it just wasn’t in the cards for me. Past the sandpits, the course headed back to the race headquarters, passed the DJ booth where spectators had ample viewing and opportunity to heckle as the course took us through some tricky, steep power climbs with side hill entries and exits, plus the ‘Log Run’ and ‘Gap Jump’, with optional ‘Cop-Out’ route. One warm-up lap in, I was already sweating up a storm. By this time, more and more racers and spectators had shown up, including Ken, who joined me for the next couple laps as we tried to get all our lines dialed in. At 7pm, in the dim twilight, I lined up in the 4th row. Knowing it was a long, uphill sprint start, I had no intention of lining up front row. That said, with 70 racers in our heat being ‘near’ the front was going to be key. The whistle went, and we took off, hammering up the hill, some of us on the paved path, while others navigated the grassy/gravely sides. By the time we hit the first set of corners, it was abundantly obvious these pinch-points were going to be ‘interesting’, and sure enough riders started making contact. Some went down causing small pile-ups. Fortunately for me, I was mostly in front of the mayhem, getting free from the main group and setting my sights on chasing down the leaders. Lap one was fast. There was lots of hard braking going into the turns followed by hard accels coming out – it was exhausting! It felt like everyone was just hammering and there was lots of passing going on. I traded spots with a couple other racers a few times, trying to stay up with the lead pack, Ken included. As lap two came around, things started to spread out a bit though, and I was able to settle in. Luckily I wasn’t hurt – so I pressed hard to catch back up. Going through the main section of the course where most of the crowds were, I was sucking wind hard and blurry-eyed, but I was right back on their wheels. When we came to the ‘Log Run’ I rode through smoothly and launched straight off the ‘Gap Jump’, knowing it was faster than the ‘Cop-Out’ route. Hitting the paved path to head back up to the top of the course for the last time, I was back in front of the racers who’d passed me when I crashed, but I was falling further behind the leaders, and much to my chagrin, Ken. Back on the course I rode as hard as I could to catch their wheels yet again, but by the time I caught them this time, I was so gassed I had nothing left to pass as we rode through the Bow Cycle ‘Smoke Tunnel’, so I rode on their wheel for most of the rest of the last lap, until we got back to the ‘Log Run’ where I decided to empty the tank. With the DJ heckling, techno music blaring, people screaming at us, brandishing glow-sticks and furiously clanging their cowbells, I hammered passed one, and then the other, shooting right into the ‘Gap Jump’ – I was back out in front with only 50 metres left to go. Then, literally from out of nowhere came a racer I’d passed a couple laps prior – he was suddenly up out of the saddle and ripping past me like I was standing still. I stood up to answer but he was totally gone and I rolled across in the line in 12th. Ken, despite having a crash of his own (over the bars on the Log Run, right in front of everyone), broke into the top ten, taking an impressive 9th! All in, that was a great race for me. I pushed hard, even harder than I usually do and rode pretty well the whole time. Checking out my heart-rate data after the race, my average was easily 8-10 bpm higher than any other race I’ve done this year. I will admit racing in Calgary (3,557 ft), even though it’s only moderately higher than Edmonton (2,192 ft), takes its additional toll on the old cardio system that’s for sure. Useful to know now though, that I can race with my heart-rate up that high, and still finish strong. The other really nice thing about not being an official ABA race is that it allows racers to really get into the fun of the event. People don’t take this race as seriously as an ABA race, because there are no points on the table here, just a chance to race hard, have fun, win some prizes and get a little crazy! So, once our race was over, with the sun long gone, and Group B ready to go, the ‘party’ was in full swing. I’d guess there were at least about 200 spectators under the COP lights in the main viewing area alone, not to mention the ones spread out around the course. Watching a race in that kind of environment is a blast! Everyone is there to just cheer/heckle on the racers, and have a good time. When the Group B racers blasted up the hill-start and ripped by us, I was honestly floored at the speed they carried through! 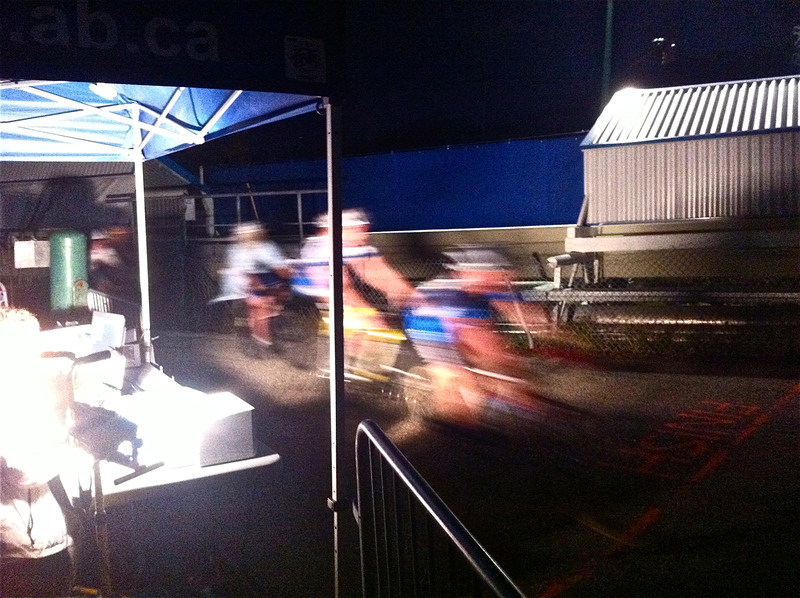 They went by like a blur in a thunderous pack of around 50. The Groups A’s were even faster! Out on the course, now in total blackness save the COP lights and the Christmas lights that lined some of the course taping, it was cool to see all the costumes, the bikes tricked out with glow sticks wrapped around their frames or attached to their wheels. Kudos to Cowboy Sean Carter from BikeBike, to the Banana-Boy, Machete! and Dave Roberts for rockin’ that tweed blazer the entire race! Ken and I moved around the course a bit, watching from down near the sand pits and then back up at the ‘Gap-Jump’ – we screamed ourselves hoarse, cheering on the racers we knew and heckling those we didn’t. There is no question in my mind, the Dark Knight is a pretty darn special race/event. This year may have been my first time at it, but it certainly won’t be my last! I’m sure we’re going to see this event only grow from here – and maybe not just with racers. This is a great time for anyone, just to come out and be part of the party. Looking forward, this event is so much more than a cross race. The next level has to be to add a beer gardens, and some food trucks! This event has everything it needs to be huge! Speaking of huge – a HUGE thanks goes out to our host Ed Gavin, his crew of volunteers, and the sponsors who make this race happen each year! Thank you! Can’t wait for 2013! 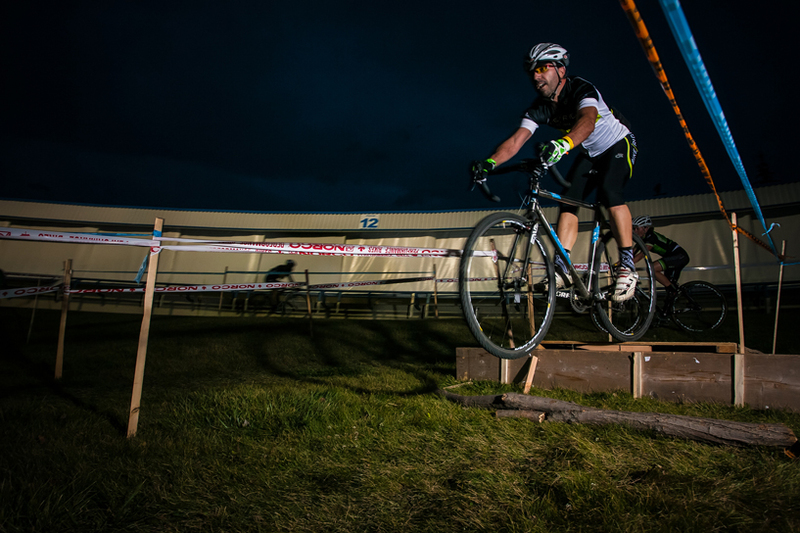 I also need to add, that if you’ve never raced cyclocross before, though this race might seem intimidating, there is a ‘D Group’ that starts at 6pm, meant for first-time cross racers. So, if you’re looking for a fun race to start off with, I’d highly recommend this one. I watched this race and everyone was having a great time! Lots of wicked event photos from Green Circle here. Still looking at your HRM while racing, Smart? Tisk, tisk, tisk. Also, beer gardens, food, etc, etc add to the complexity of the event due to it being held at COP and the exclusive contracts they have with their food service people. The costs to do the beer garden would be ridiculous and I think it would take away from the family party feel the event has going for it. Hell, they even wanted to charge us $500 cash to allow the waffle truck in. Hi Ed, thanks for the insight into the event from the organizer’s perspective. I can see how you’d want to keep it rolling as is. It’s already awesome!